It’s hard to imagine putting a baby on sticky, prickly straw. As we prepare for our newborn babies to enter this world, we scope out every baby specialty store in the country to find just the perfect crib and matching sheet sets. The crib has to be ergonomically correct with no lead paint on the finish. The mattress must have three-inch thick foam and be waterproof. The sheets must be all cotton, hand sewn and made in the USA. The crib sheet needs to match the comforter and bumper pad which should coordinate with the wall hanging and the character mobile. The bedding should all be washed in chemical-free laundry detergent and hung to dry in the fresh air and spritzed with lavender essential oil made from the organic lavender grown in the field that has been “naturally fertilized” by the range-free chickens. But Jesus, the King of the World, the one who can save us from our sinful self; the One who can change our heart and life with the snap of a finger, was born in a barn, wrapped with soft rags and gently placed on sticky, prickly straw. No crib. No mattress. No matching comforter. No lavender-spritzed sheet. Yet it was good enough for a King. Our King. That baby lying on that sticky straw is why we even have Christmas to celebrate. 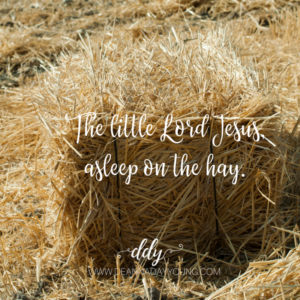 Let us remember Him as we go through this Christmas season and maybe think a little differently as we sing “away in a manger, no crib for a bed”. This entry was posted on December 19, 2017 with tags: #makeadifferenceeveryday, christmas, Jesus by Deanna Young.